For more information or to make reservations, call 1-866-206-7123. Vacation rental. This three bedroom, two bath property has a king in the master, a full bed in the first guest room, and two twins in the second guest room. 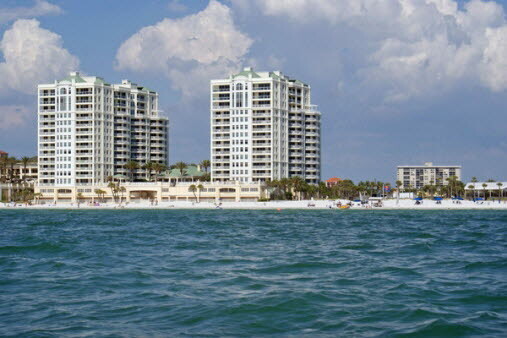 Excellent views of the intracoastal waterway, Clearwater Harbor, and the lights of Clearwater from the large balcony. Enjoy all that Belle Harbor has to offer including harborside pool and hot tub, waterview fitness center with sauna and steam, billiard rooms, community rooms, assigned covered parking, and 24 hour security. Rates: Jan - Apr, and Jul: $5,250. May-Jun, Nov-Dec: $5,000. Aug-Sep: $4,750. Vacation Rental. This three bedroom, two and a half bath property has two balconies so that you can enjoy all the views of Clearwater Beach. There are king beds in the master and first guest bedroom, and a full bed/twin bunk combo in the third bedroom. Enjoy all that Mandalay Beach Club has to offer including the beach view pool and hot tub, fitness center, community room, billiard rooms, grills, assigned covered parking, and 24 hour security. Monthly rent: Jan - Apr, Jul: $5,750. May-Jun, Nov-Dec: $5,500. Aug - Oct: $5,000. Vacation Rental. This three bedroom, two and a half bath property has two balconies so that you can catch both the sunrise and the sunset! This unit has a king in the master bedroom, a queen in the first guest bedroom, and two full beds in the second guest bedroom. Enjoy all that Mandalay Beach Club has to offer including beach view pool and hot tub, fitness center, locker rooms with steam and sauna, three community rooms (two with billiard tables), covered assigned parking, and 24 hour security. Rental rates: Jan - Apr, July: $5750, May-Jun, Nov-Dec: $5500, Aug - Oct: $5250. Vacation Rental. This three bedroom direct gulf front property boasts spectacular views of the Gulf of Mexico and Clearwater's sugar white sands. Enjoy the evening sunsets from the large balcony that overlooks the beach as well as the pool. This premium property has a king bed in the master, a queen bed in the first guest room, as well as a full murphy bed in the second guest rooms, with televisions in all three, plus the living room. Enjoy all that Mandalay Beach Club has to offer including beach view pool and hot tub, billiard and community rooms, fitness center with steam and sauna, assigned covered parking, 24 hour security, and so much more. minimum thirty day rentals. Rental Rates: Jan - Apr, Jul: $7000/month. May/Jun, Nov/Dec: $6500/month. Aug - Oct: $6000/month. Vacation Rental. This three bedroom beachfront unit has a king in the master, a queen bed in one guest bedroom, a full bed in the other guest bedroom. There are also two and a half baths. 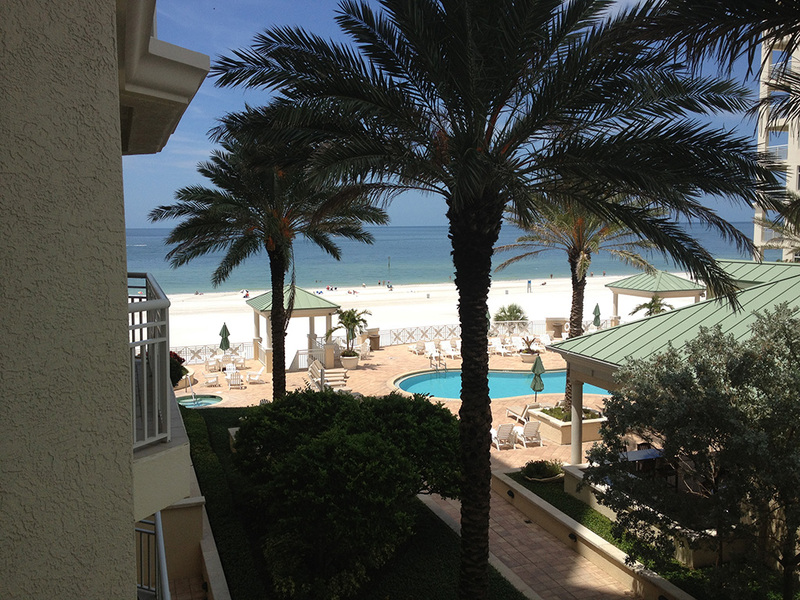 Direct views of the Gulf of Mexico from the large balcony. Enjoy all that Mandalay Beach Club has to offer including beach view pool and hot tub, community/billiard rooms, assigned covered parking, and 24 hour security. Rates: Jan - Apr, July: $6250, May - Jun, Nov - Dec: $5750. Aug - Oct: $5000. All rates exclusive of taxes and fees. Vacation Rental. Spectacular model property, three bedrooms and three bathrooms. King bed in the master, queen in the first guest bedroom, and two twins in the second guest bedroom. Look directly across the pool out to the beautiful Gulf of Mexico. Enjoy all that the Sandpearl Residences have to offer including gulfside pool and hot tub, fitness center, community room, billiard room, covered, secured parking, and 24 hour concierge/security. Rates: Jan - Apr, Jul: $8000, May - Jun, Nov - Dec: $7500, Aug - Oct: $6750. All rates exclusive of taxes and fees.